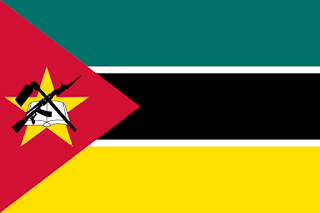 Mozambique is a country in Southeast Africa. Caril de Caranguelo is a spicy crab curry made using Peri Peri sauce. I'm interested to try crab again since I've only had it once before. Saute it in the oil until it starts to sweat. That's what the instructions said but our onion wasn't very sweaty. Add the garlic and tomatoes then cook for another couple of minutes. Add the peri peri sauce and the white wine. Stir well. Next add all the spices and the bay leaf. Stir them into the curry. Add the crab and stir it in watching it change colour as the spices soak into it. Last but not least add the coconut milk and simmer the curry for 10 minutes. We ate our curry with some bread to dip in it which eased us into the spiciness gradually. It was a lovely texture with the flaked crab in the sauce but the spiciness of the peri peri (even though I only added 2 spoons of it) was just too much. The curry made our noses run it was so hot. I'd like to try it again with less spice so I can taste the other ingredients. I liked that it was more like a curry soup than a chunky curry. Lovely but just too spicy for us!